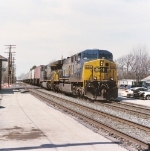 Description: 650 is about to enter Augusta Yard in this 1999 photo. Description: CSX priority trailer train Q172 slowly rounds the curve eastward under the wires of Septa territory, passing CSX Woodbourne Yard to your left. Description: CSX trailer train Q172 rushes eastward on trackage shared with Septa under a busy highway behind the 650. Title: CSX 650 leads K651 but a Dash 8 awaits. Description: A Conrail transfer caboose sits in Oak Island yard. Title: CSX 650, passing a waiting northbound on the nys&w main. 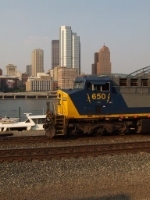 Description: Q139 with a single AC6000 passes the Pittsburgh skyline at 6:16PM. Description: Metuchen Road, 1853 hours. Description: A CSX light Engine move which is suspected to be X013, heads east through Worcester Station. Description: A trailing View of the light engine move. With B722 in the background. Title: CSX #650 approaching Cobblestone Road. Description: A freight passes by with a AC60CW leader and two SD70MACs. Description: Eastbound CSX general freight Q438 approaches CP Nice on the Trenton Line amidst a bit of snow as Q439 rolls westbound alongside. Description: CSX manifest freight Q438 rolls eastbound approaching CP Nice as westbound counterpart Q439 rolls toward CP River alongside amidst snow.